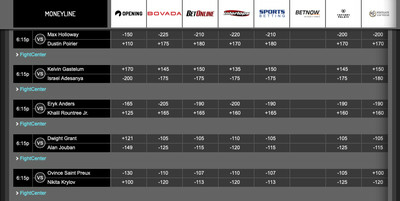 Check out the midweek betting odds for Saturday’s UFC 236 event, where Max Holloway is favored over Dustin Poirier in their high stakes main event rematch. The UFC 236 PPV card is set to blast off this weekend from the State Farm Arena in Atlanta, Georgia. Bloody Elbow is here to provide the mid-week betting odds. The UFC has received ample flack from its critics about its long-documented knack for pitting prospect versus prospect early in their careers. Well, the top of the UFC 236 billing is one of those rare instances where we get a rematch of said prospect vs. prospect matchmaking, but in the form a high stakes title fight. 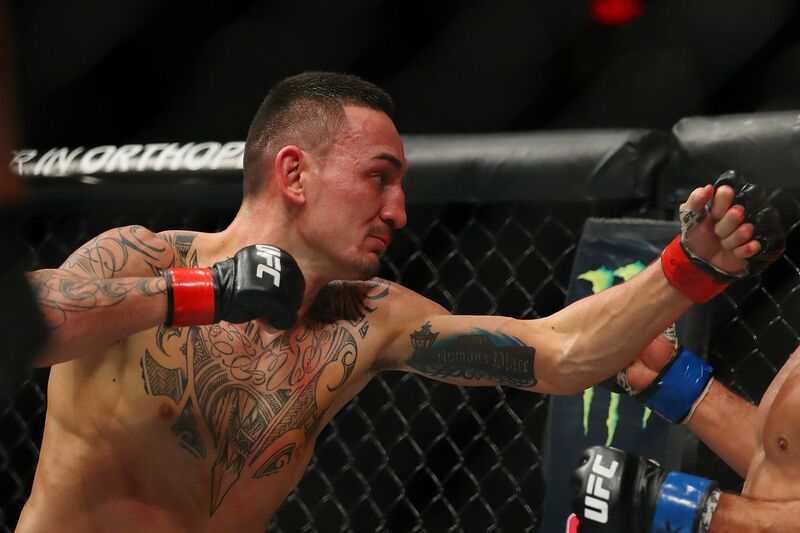 The promotion’s featherweight king, Max Holloway will be taking on the company’s #3 ranked 155-pounder Dustin Poirier in the main event, with the winner capturing the UFC’s vacant interim lightweight belt. The featherweight great in Holloway clocks in as a -210 betting favorite to the +175 underdog Dustin Poirier. The first time these warriors did battle, it was back in 2012 at the UFC 143 event. Holloway made his promotional debut on that card as a +425 underdog against a more experienced -545 betting favorite in Poirier. The ground was Poirier’s path to victory back then, pulling out the first-round submission with a gorgeous triangle armbar. Fast forward to present day, and you will find the over/under for this vacant interim title bout set at 2.5 rounds. The ‘over’ owns the favored line here with a value of -150, with the ‘under’ sitting with a dog tag of +130. If the odds are any indication, then this main event matchup will not be lasting the full 25-minutes. The prop bet ‘Fight doesn’t go to decision’ is strongly favored with a moneyline of -215. ‘Fight goes to decision’ can be had for the underdog price of +170. It’s no secret that Max Holloway is a straight up killer. In his last four fights, he has successfully TKO’d Anthony Pettis, Jose Aldo twice, and the ridiculously tough Brian Ortega... and in that order. ‘Holloway wins by TKO/KO’ can be picked up for +156. Poirier is right there with Holloway in terms of lethality. After his brutal NC in his first fight with Eddie Alvarez, Poirier sequentially stopped Anthony Pettis, Justin Gaethje, and then Alvarez in their rematch. 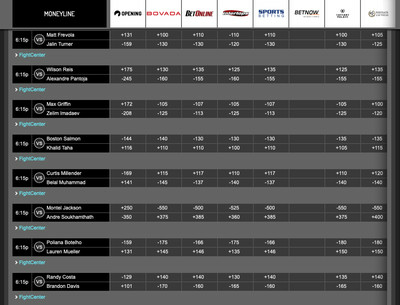 ‘Poirier wins by TKO/KO’ can be obtained at +428. The UFC 236 co-main event will see the undefeated 16-0 Israel Adesanya war it out with the #4 ranked middleweight, Kelvin Gastelum, for a 185-pound interim belt. In arguably his biggest UFC-test to date, Adesanya is the betting favorite here with a moneyline of -170. Despite having the edge in experience against world champions, yet considering that he has already tasted defeat, Gastelum clocks in as a +150 betting underdog. The over/under for UFC 236’s co-main event title fight has been set at 3.5 rounds. The ‘over’ sits in the favored role with a line of -130, with a +110 comeback on the ‘under.’ Even though the odds favor the ‘over,’ the bookies still see this matchup ending early. ‘Fight doesn’t go to decision’ can be found with a favored moneyline of -135, with ‘Fight goes to decision’ at a slight underdog line of +105. With 19 (20*) knockouts between the two (Gastelum-6 + Vitor Belfort*; Adesanya-13), you can grab ‘Adesanya wins by TKO/KO’ for +278 and ‘Gastelum wins by TKO/KO’ for +384. The UFC 236 main card will air live on Pay-Per-View at 10:00 P.M. ET with the prelims starting at 8:00 P.M. ET on ESPN. The exclusive Fight Pass prelims will begin at 6:15 P.M. ET. Be sure to check back in with Bloody Elbow to catch the final betting odds on fight day, as the moneylines tend to shift a bit following the weigh-ins. All of your event coverage including play-by-play, results, highlights, and more can be found right here at BloodyElbow.com. Happy hunting!